A large number of people I know go bananas for anything chocolate. Don’t hear me wrong, I love chocolate, especially dark chocolate – the higher the cocoa the better in my book. But when it comes to anything with caramel, now my ears perk up and my mouth begins to salivate. Ever since being a kid, I have loved caramel. If any of you remember the caramel sundea that was served at McDonalds – it was the best. This was before it turned to be frozen yogurt and it was real ice cream. It had a distinct creaminess that was out of this world and that hot caramel topping – for fast food it was delicious. Today caramel has gone designer. All the rage is salted caramel. I must confess, it is dangerously delicious and quite addicitive. The funny thing is that it is super easy to make and keeps in the refrigerator for a lifetime, it seems. When I finally opened my February issue of Martha Stewart Living, I could not help but have my eyes drawn to these delightful cookies. 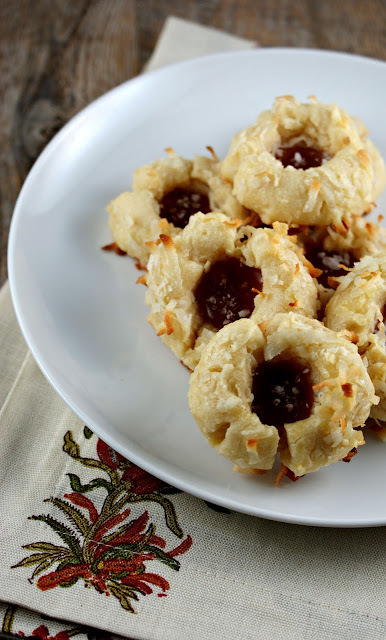 The word salted caramel and coconut drew me in and to imagine that this was rolled up into a buttery thumbprint cookie – now I am in cookie heaven. 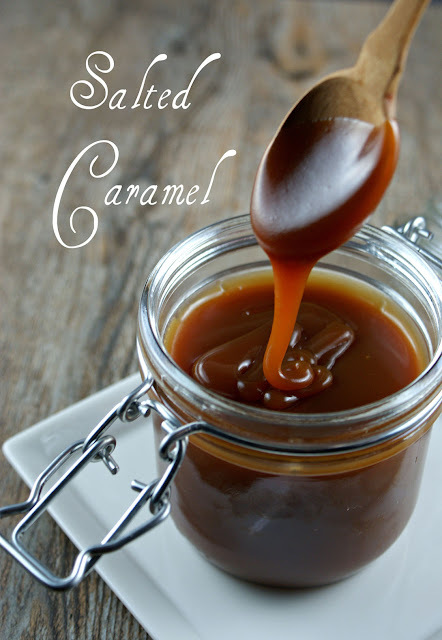 I modified the recipe by adding more vanilla and making my own salted caramel sauce along with cutting the cooking time. The result was amazing and highly addictive. Since I knew I would not have any self control, I opted to bring them to one of my offices and share. Later in the day, I received this email from Redford who I work with. I just had to share with all of you. They were amazing! I just finished the last caramel-macaroon-fabulousness. Preheat oven to 350 degrees. Beat together butter and sugar with a mixer on medium speed until pale and fluffy, then beat in vanilla. With mixer on low, gradually add flour and 2 teaspoon table salt, and beat to combine. Press dough together in plastic wrap or into two balls, then roll into 1 1/4-inch balls. I used a small cookie scoop to ensure each cookie was uniform in size. Dip each ball in beaten egg with water, and roll in coconut. Place balls on parchment-lined baking sheets, and press an indentation into each with your thumb. Press a bit together if the sides spread out to much. Bake for 10 – 12 minutes, then remove sheets from oven, and re-press indentations. I used the end of a rounded knife to push the dough down. Let cool on wire racks. Repeat with remaining dough. Stir sugar, water and lemon juice in a large saucepan over medium heat until the sugar dissolves. Increase the heat; boil without stirring until the mixture turns deep amber brown. This should take about 9 minutes. Take off the stove and hold over the sink before pouring the cream mixture into the sugar mixture. It will boil and bubble. Once calmed down, add grey salt and set back on the burner and reduce slightly over medium low heat for about 8 minutes. Chill until thickened. Put into another container and let come to room temperature when ready to use. Spoon into indentations in cookies, and sprinkle with sea salt. Mmmm such a yummy cookie! Awesome idea! Thank you! Let me know how you like them if you make them. Have a great weekend! 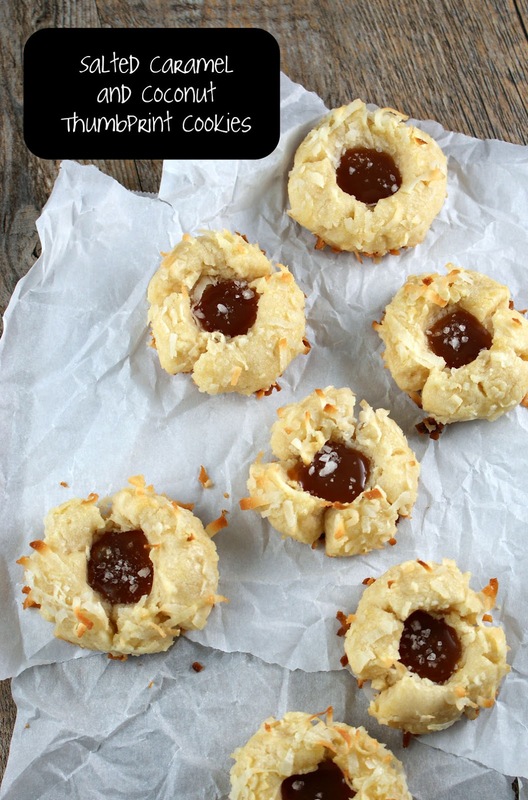 Lisa, this was the last post I read last night so needless to say, I fell asleep thinking of these gorgeous thumbprint cookies. Salted caramel in a cookie? This screams winner to me! I bet you had dreams of caramel! They are really delish! Have a wonderful weekend. Let me know how the caramel sauce turns out. It is super simple and I typically have a small spoonful. Or two. Enjoy your weekend and thanks for stopping by. I'm with you regarding caramel! And, I've had my eyes on these cookies since seeing them in Living. 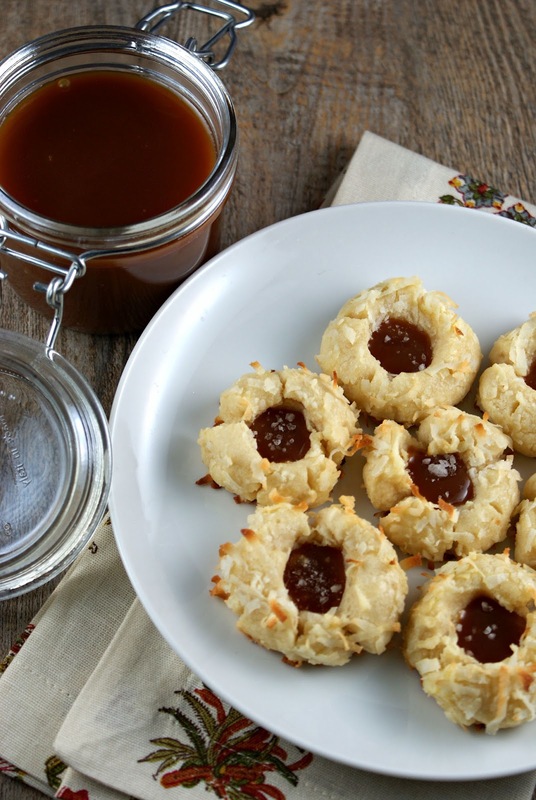 Your salted caramel sounds great for them. Wish I could grab a few off the screen. I know -didn't they just pop off the page and scream - make me now! If you love caramel - you will flip for this one. These are one of the cutest thumbprint cookies I have ever seen! Lisa, these cookies look like they might be dangerous in my kitchen! I love the salted caramel, please pass the spoon, lol! That is why I brought them to work since I know that I would eat WAY too many. Wait til you taste the caramel -it is simply divine and wonderful over vanilla ice cream. We think we'd eat most of it out of the bowl too! They sound, and look, amazing! These were on the cover of Martha Stewart Living last month. They were featured in the February issue of Martha Stewart's living on page 6 and the recipe is on page 145 or you can find it online. Enjoy! that salted caramel looks SO delectable!!!! 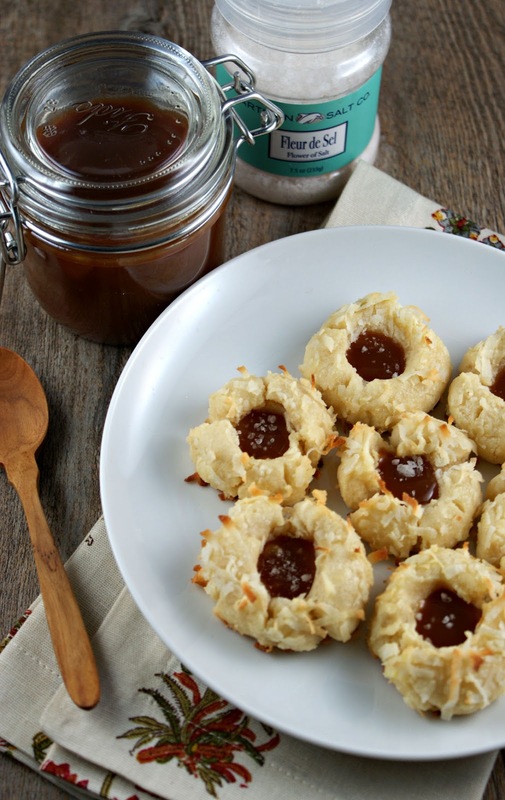 I love salted caramel :D and to combine them with coconut yummy! Thanks for sharing! Congrats for being Top 9 on Foodbuzz! Thank you for stopping by and the nice comment! Have a great night! Thank you for stopping by! 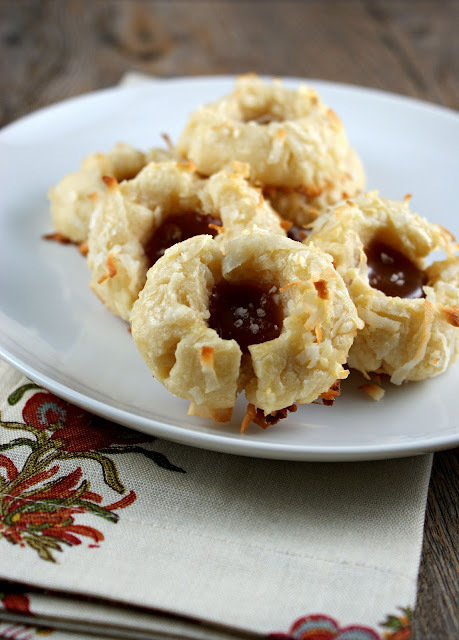 If you love caramel and coconut - you will be in heaven on your first bite. Wow these look delicious. That caramel really gets me, love that photo. I bet these are really tasty. Congrats on the Top 9. Thank you for stopping by and the kind words. Once I took that photo of the caramel - I too love it. That looks like the best salted caramel! Thanks for the recipe! You are welcome! Thank you for the nice comment. I love the combination of salted caramel and coconut. Your cookies look delicious:) Congratulations on Foodbuzz Top 9! Thank you for the nice comment and stopping by. Hope that you enjoy them If you make them. These look and sound so good! I love this idea, salted caramel and coconut would be so heavenly! Thank you! If you make them - let me know how you like them. Thank you for the kind words! I must say that my offices do benefit from my baking binges. Have a great upcoming weekend! Makes approximately 54 cookies. Enjoy! hi wow much is 3 sticks? i'm from argentina and i want to make this sooooooo much! thank you! 1 1/2 Cups of butter! ENJOY!! !